I have a problem where my application in Wildfly 10.1 sometime is leaking database connections. We recently updated Wildfly from 9 to 10.1 and started to experienced that our web application sometimes (randomly) leaked database connection after startup of the Wildfly server (or rather it seems that the some transaction are not ended so the connection is not returned to the pool). When we monitor the number of active connections in the connection pool for our XA datasource, we can see that it quite soon after startup of the Wildfly server, the active connections starts to increase rapidly. Our max Pool Size 800 and we will typically reach this after 10-15 min if we don't restarts the server again. Under normal condition, the number of active connections are typically around 30-40. Typically, we let the Wildlfy server start up, and then starts Apache so customer can reach our web application. looked up through the InitialContext. There is quite some load on the server right form the start when Apache is started. Java 1.8.0_102, PostgreSQL 9.3.14, uses the provided Hibernate. Currently, our only workaround is to restart the Wildfly server until it behaves "normal". When it is started without any problem it, runs fine. We suspect that sometimes the transaction for a remote EJB call is not ended for some particular scenario during startup. Unfortunately, we can not reproduce it and we are running out of ideas how to proceed the investigation. Have anyone experienced the same issue or have any clue how to continue the investigation? who is connecting to your remote EJBs? Maybe you have some rouge client that is waiting for server to get up and than when it gets it starts processing "too much" of backlog requests at same time. once it is done load drops. This could describe behavior you are seeing. Yes, it could be a high load issue at startup. We have more or less three types of scenarios for the EJB usage. From what I remember, the JCA layer had (has?) a feature where it would log the stacktrace of the caller which pulled out the connection from the pool for use but never returned. I think it's some config you have to set on the subsystem (datasource?) to get this stacktrace. Maybe that will tell you what piece of code might be triggering this issue. Thanks, I have actually already enabled these logs and that show I found out that it was only different remote EJB calls causing the issue, but unfortunately I could get to the root cause by analyzing the callstack. Then restart Wildlfy since there is an enable flag which is static and only read during startup (see more in this class org.jboss.jca.core.tracer.Tracer). Be a bit careful with this since the log is quite verbose and if there is a heavy load on the server, the log will soon fill up much space. we see two exceptions . This is is happening in the night. 2. javax.ejb.EJBTransactionRolledbackException: Transaction rolled back. Caused by: javax.transaction.RollbackException: ARJUNA016053: Could not commit transaction. is there a way to release database connection in these type of scenarios?? we have the same issue. From stacktraces you pasted, you have completely unrelated remote EJB issue. so please do not hijack the this thread but create new one, where you should post details about your problem. sorry i did not mean to hijack the discussion. I did post another question.Below is the link with details. But it has the same behavior. I have narrowed down starting point to be when we populate some of hours caches at startup and we performs some fairly big SELECT queries. What we can see is that a transactions begin but never gets committed nor rollbacḱed eventhough the EJB is done and returned the data. 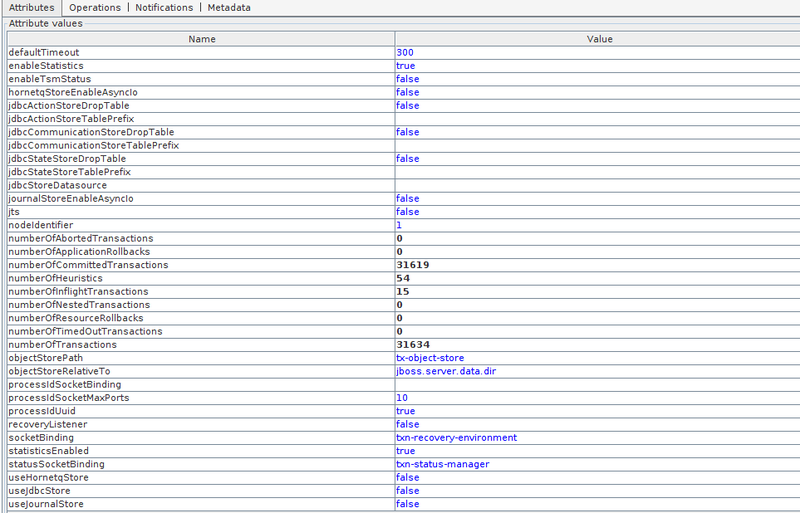 And from the jboss.as.transactions MBean I can see that the numberOfInflightTransactions is the same as the aboww postgresql table. There are no threads in blocked state from the thread dump. I have also taken a headdump but it is rather hard to find around in. The application runs fine and has received it data, the only problem is that the transaction has not been finished. Please post that relevant code. I have attached the log "serverlog_2016.12.02.txt" with some of the server log. Soon after there is an incoming HTTP request, thread "default task-86", that starts to execute another query. This is the one that never gets committed in postgres and I can see that the last part of the query is the one that is the last run query in postgres and the connection that is 'idle in transaction'. The scenario here is when I reproduced it, in production we wait longer before allowing incoming HTTP requests but we end up with the same state of the connections. Without seeing the relevant code from that servlet and that EJB, it's hard to say what's wrong and if there's some potential bug here. If you won't be able to paste the relevant code, then perhaps you could try your application against the nightly builds of the master branch of WildFly  and see if it's fixed there (I know of an issue which got fixed in there where the EJB invocation was allowed a bit early than it should be, but I don't know if it's even remotely related to what you are seeing).